Located at 6476m on the edge of Khumbu region, Mera Peak Climb allows the adrenaline of climbing the highest trekking peak in Nepal by following the non-technical yet physically challenging route where you need to climb snow slopes and ice sections that are within 30 degrees limits. 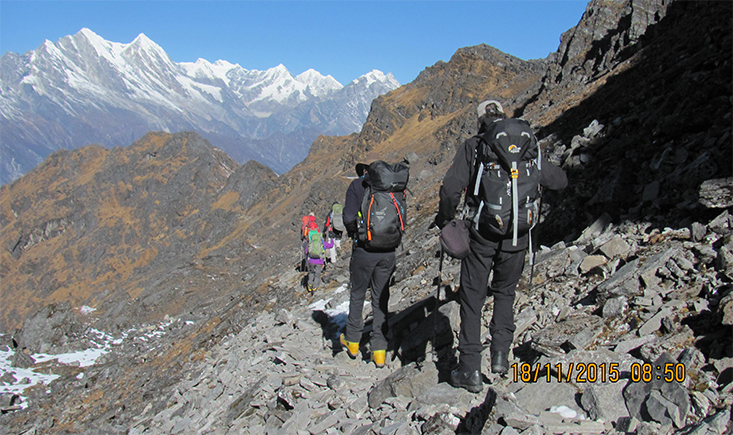 The challenging climb to the summit rewards us with breathtaking views of five 8000m Mountains. Everest and Lhotse greets us from the north while we can get close-up views of Kanchenjunga and Makalu to the east and colossal Cho Oyu dominates the western skyline. This is the perfect peak for your first climbing experience. 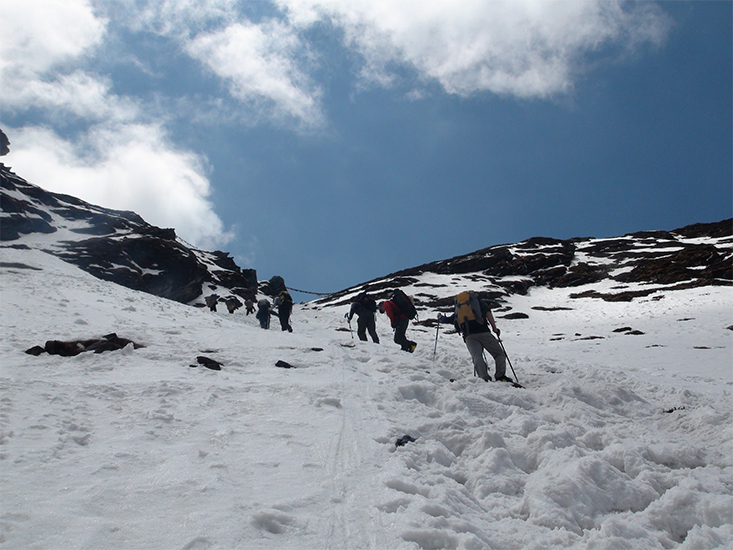 Our Mera Peak Climb itinerary has been devised keeping every aspects in mind. Our trek to the base camp of Mera Peak follows less trodden trails ensuring proper acclimatization instead of the usual Zatrwa La Pass. After week long trekking through the remote picturesque villages and forests, we get to the Mera base camp for our climb. We will start our journey to the summit from our High Camp. 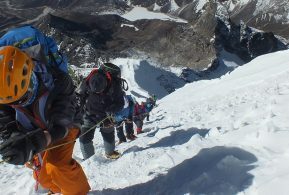 The cold weather coupled with the excitement of conquering the summit will motivate us to prepare early for the climb. We will start making arrangements at around 2 to 3 am and we will begin the slow climb at gentle pace by dawn. It is going to be a long journey and it all depends on your stamina and weather conditions. Quick descent from the summit will take us to Khare where we will celebrate the successful climbing of Mera summit. Why climb Mera with us? At Highland Expeditions we always believe in ‘Safety first and Service paramount’. 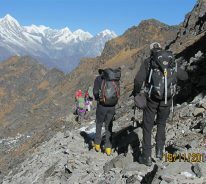 The success of any climb depends largely on carefully planned itinerary and best logistics and these are what we offer. Our Mera Peak itinerary has been carefully devised keeping every aspects in mind. We have rest and acclimatization days, pre climbing training day and of course a contingency days. We are committed in maintaining the climb safe and success with quality of service. Our emphasis is always on maintaining the small group so that it will be easy to coordinate and cooperate with each other. You will be guided by highly professional guides who have experience of successfully climbing several national and international peaks. At Highland Expeditions, we provide 1:3 sherpa guide to client ratio on summit days. We are dedicated for providing highest professionalism throughout the climb by taking utmost care of all the logistics needed. 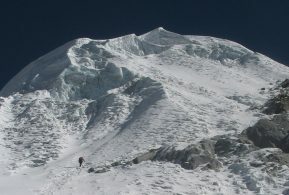 Mera Peak is graded under Alpine PD+ which suggests it to be a challenging climb. Use of harness and crampons is a must to climb these slopes. Since you will be receiving a full day pre-climb training, where you can learn mountaineering skills and know the correct way of using climbing gears, previous experience of climbing is not essential. 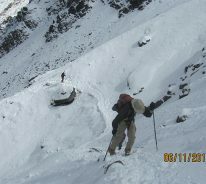 It would be beneficial to have previous experience of trekking in high altitude. Prepare yourself for the climb with some regular training including running, cycling or gym work. Be prepared to walk for 6-7 hrs per day on average. 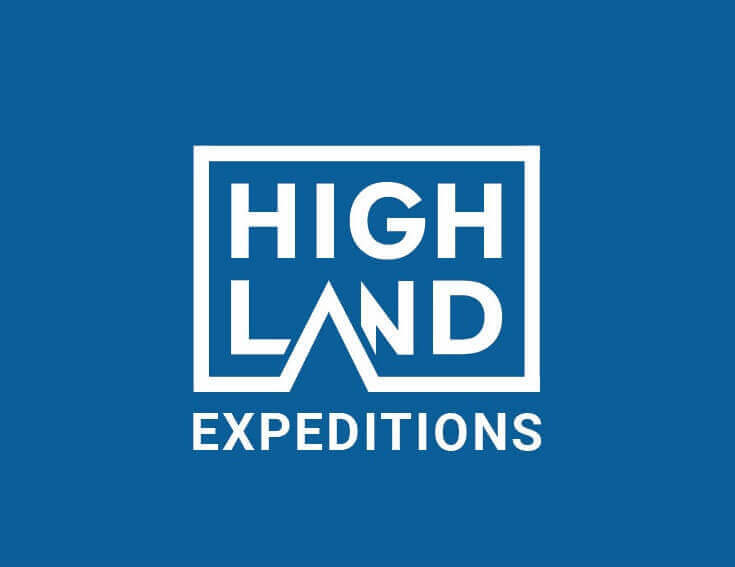 Your safety is of imperative concern while traveling with Highland Expeditions. Please take care to note that your leader/guide has the authority to amend or cancel any part of the itinerary if it is deemed necessary due to your safety concerns. Every effort will be made to keep to the above itinerary; however, since this adventure entails travelling in remote mountainous regions, we cannot guarantee that we will not deviate from it. Weather or health condition of a group member, unexpected natural disasters, etc., can all contribute to changes in the itinerary. 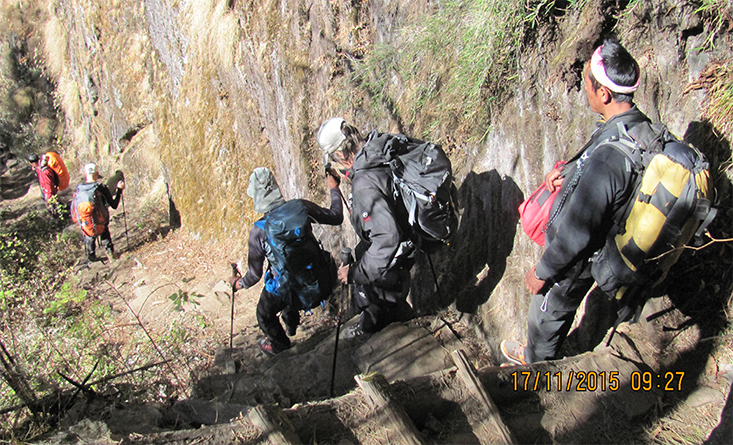 The Trek & Climb leader/guide will try to ensure that the trip runs according to plan, but please be prepared to be flexible if required. After your first night in Kathmandu, you will be well informed on arrival about the time for briefing and equipment check. However, sometimes, depending on your flight arrival, if it’s too late into the night we will do equipment check in the afternoon instead of morning to give you some sleep and rest so that you can get rid of that jet lag. 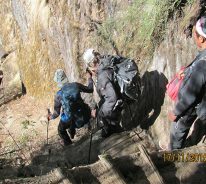 In the evening, you will be briefed by your trek and climb leader about your trekking program the next day. In case you have fallen short of any trek and climb equipment that you may need, this time can be used to arrange for it. 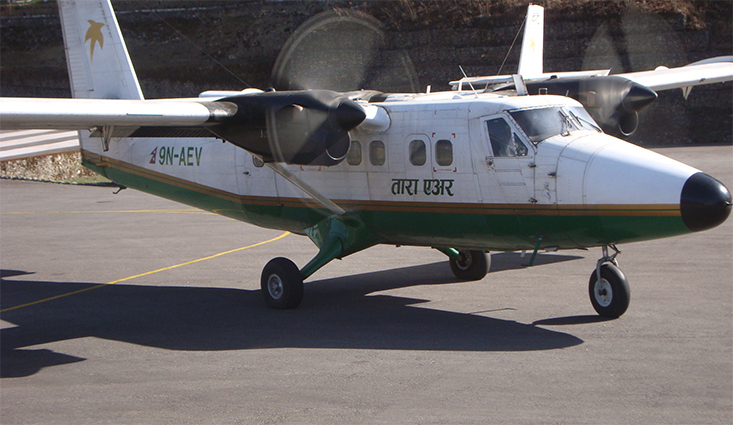 After an early morning b/fast, we take the flight from Kathmandu to Lukla on STOL aircraft. Flight time is about 35 minutes to the airstrip built by Sir Edmund Hillary and the Sherpas in the mid-1960s. It is a memorable flight, with outstanding views of the eastern Himalaya (sit on the left side of the plane for the best views). 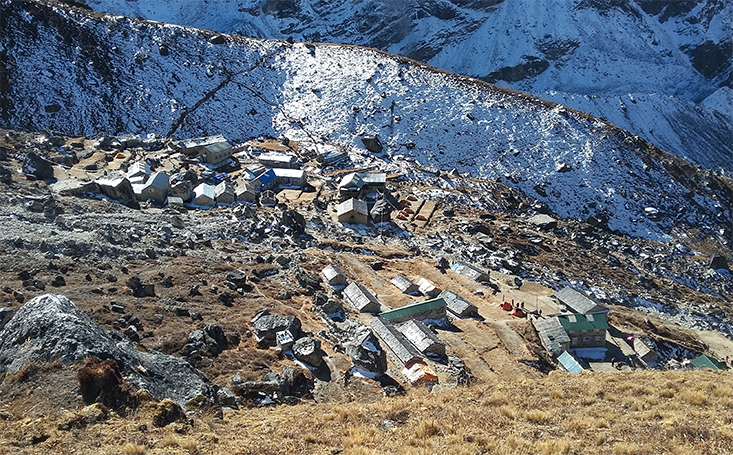 At Lukla we are immediately overcome by the scale of the massive peaks that surround the village but this is only an indication of what is to come. 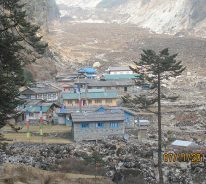 We will leave Lukla and follow the relatively easy trail through the woods of colorful rhododendron and pine to Poiyan via Surke village. After breakfast, we travel through dense forest and begin a climb to the picturesque village of Pangkongama with splendid views of the surrounding valley and a nearby monastery. After an early morning tea, we will take about 3-hours of downhill trek through rhododendron forest. We will be taking lunch amid the forest before continuing the trek along Hinku River. It will take couple of hours to reach Kothe where we will stay overnight. This is going to be an exciting day as we will be entering Barun National Park. Leaving our camp in Khote early in the morning, we will receive an entry permit of Barun National Park. Once the officials confirm the permit check, we will proceed to Thaknag. The trail leads us along the edge of Hinku River about 4-5 hours to lead us to Thaknag which will greet us with awe-inspiring views of Thamserku, Kusum Kangru and Kangteka peaks. We will take necessary second break from our trek on this day. 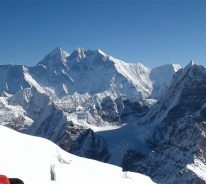 Since an activity helps us in proper acclimatization, we will be taking side trip to Charpate Himal Glacier. 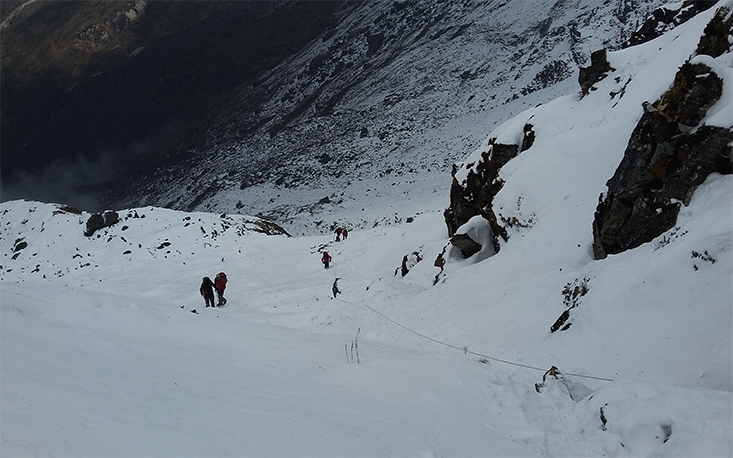 It will take 3hrs to reach Charpate Himal Glacier. This glacier holds a great religious significance among native Sherpas. 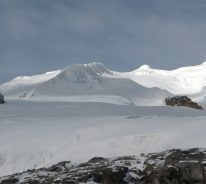 The glacier allows an unobstructed view of Mera North. Later, we will return to our camp in Thaknang for overnight stay. After an early morning breakfast, we will leave Thaknag and move through the lateral moraine of Dig Glacier to reach Dig Kharka. We will be greeted with pleasant view of Charpate Himal from Dig Kharka. We will follow the ascending path through moraines to the snout of Hinku Nup. 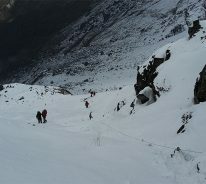 Proceeding further, we will cross Shar Glacier and follow the steep path uphill to Khare where we will camp overnight. 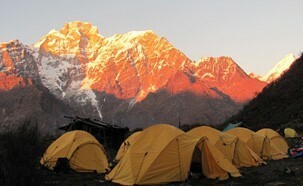 The camp site in Khare allows exquisite view of North face of Mera Peak. You will receive a pre climb training from our climbing guide on this day. You will get instructions on peak climbing techniques. You will also be taught how to use the climbing gears like ice axe, crampons, harness and ascender properly. You will learn how to use ropes while you move up and down. So, even an amateur with no prior experience of peak climb can also participate in Mera Peak Climbing. 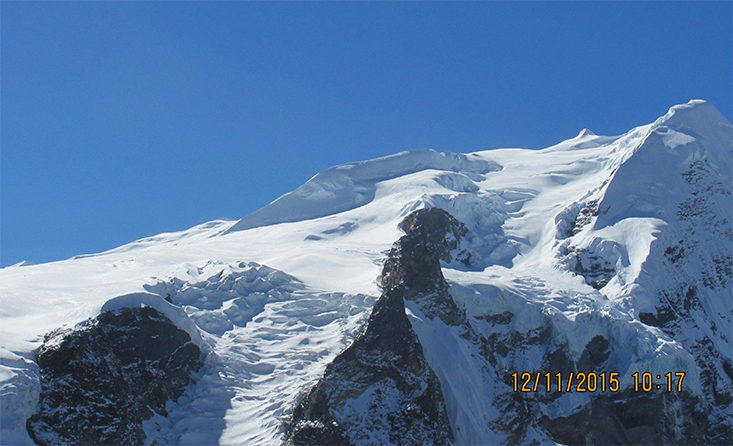 We will head to the top of Mera Glacier and practice using our climbing gears. Later, in the evening we will return to Khare for overnight stay. Journey continues along glacier for most of the day. The trail takes us close to the northern section where there are no crevasses. 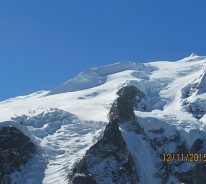 Mera La stretches south to meet the lofty sweep of Mera glacier which drops down from Mera Peak. We will stay overnight in Mera La. 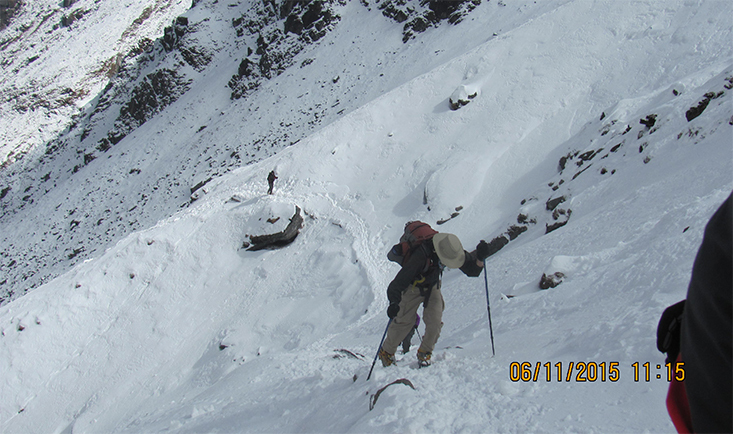 We will need to use climbing gears like Crampons and axe to take the steep ascend to High Camp of Mera Peak. From Mera La, we will ascend the glaciated path. 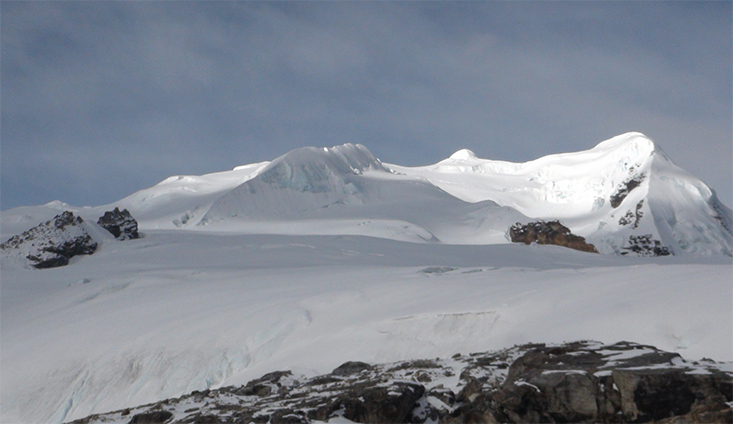 At around 5800m elevation, we will find a rocky section among glacier to set up our high camp. Existing at the edge of mountain, the area offers striking view of Kanchenjunga that rises to the east above the ridge of Chamlang. 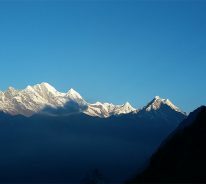 We will also get exquisite views of Makalu, Ama Dablam, Nuptse, the southern section of Lhotse and Lhotse Shar Mountains. We will wake up much early on this day. After tea, we will take slow climb towards the summit. Temperature remains on an average 10 degree Celsius below Zero on this region. We will climb the glacier and proceed to snow hump-back ridge. We will follow the non-technical and classic route through the south-east ridge. Climbing further through the snout of glacier, we will climb over the south summit to the summit ridge. Finally, the moment comes for which all of us were eagerly waiting. We will get the 360 degree views of many eight thousand meter peaks including views of Everest, Kanchenjunga, Makalu, Cho Oyu, Lhotse and other peaks and mountains. We will spend some time on summit witnessing the views before taking gradual descent to Khare where we will celebrate the successful climb and stay overnight. This is a free day. Peak Climbing is a challenging task. Multiple factor like weather condition comes into action. Also, our crew members might get injured or sick from High Altitude Sickness. In such case, our schedule might get affected. This contingency day will help us to make sure that our schedule will go on smoothly without interruption even if there occur complications while climbing the peak. We will leave Khare and lower down through the Hinku valley to Khote. The trail is much easier as we will be taking steep descent.. Early in the morning, we will follow the steeply raising trail for couple of hours through the lush green forest existing to the western edge of Hinku Valley which will take us to Thuli Kharka. The trail is pleasant. We can feel the aroma of blooming red rhododendron that breathes life to the forest. Our camp site in Thulikharka allows us the views of Mera peaks including Mera North, Mera Central and Mera South. From Thulikharka, we will climb uphill for couple of hours to reach Zatrwa La pass. The pass allows an exquisite view of Lukla valley and surrounding peaks and mountains including Cho yu, Kongde, Numbur, Kusum Khangru and others. 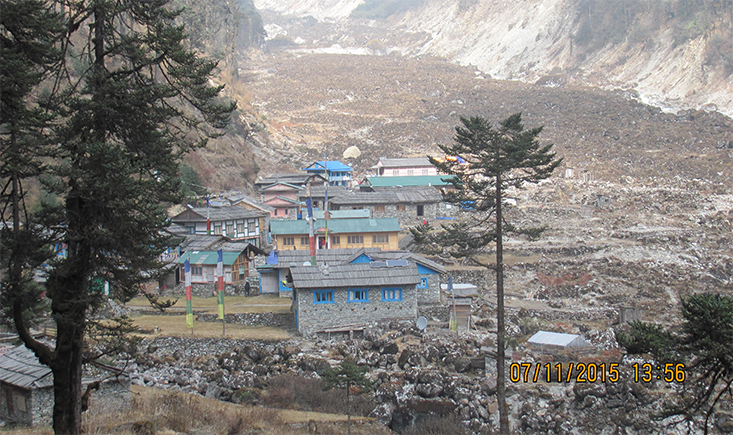 We will descend from Zatrwa La to Chutanga and follow the straight path all the way to Lukla village. Later we celebrate our successful completion of climb with our Sherpa guides and porters who we’ve got to know so well & are now good friends. It’s a pleasure to end this wonderful trip on a happy note. We then slumber into blissful sleep. 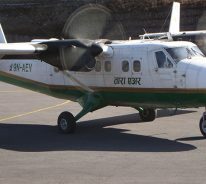 Take an early morning flight from Lukla to Kathmandu. We will be transferred to hotel in a private vehicle in Kathmandu. Take leisure and soothe your aching limbs from long and tiring peak climb. Enjoy a leisure day. You are on your own. Participating in a day tour in Kathmandu is a pleasant plan. You can also go for shopping in Thamel, a tourist hub where you can buy souvenir items like handicrafts and arts to your family. At eventide, we will relish a farewell dinner to celebrate our successful climb. While enjoying our supper, we will also be entertained to a scintillating cultural dance performed by the local belles Please do not hesitate to let us know if you would like to extend your stay. Kindly email us for more details on extensions. Finally, the undeniable day of departure arrives. Thank you for joining us on this climb and it has been a pleasure getting to know you during this time. We hope this venture has enriched your experience with happy memories. You will be assisted in your last minute preparation. Our representative will take you to Tribhuvan International Airport three hours before your scheduled flight. Keep in touch and hope to hear from you soon. Bon voyage for a safe and pleasant trip home. All meals (B,L,D) and accommodation at Teahouses/Lodges during trekking period. 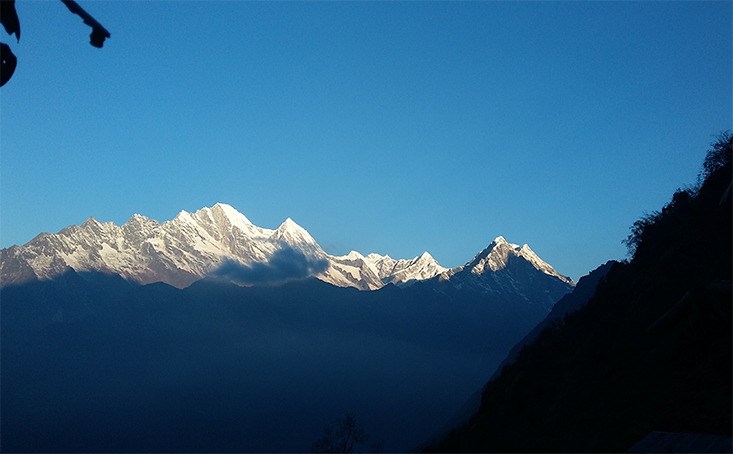 The best seasons for Mera Peak Climb are Autumn (from October till end of November) and Spring (April to mid-May). Temperatures will drop considerably as you ascend higher every day. The nights are cold (between -20C to -5C) and the days are sunny and hot (between 10C to 20C). Mornings are usually clear, with clouds building up in the afternoon and disappearing at night. 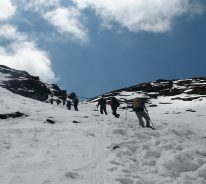 Trekking and climbing during the monsoon seasons and winters are not recommended as the visibility is poor and limited whilst upper parts and high passes could be covered with snow. March, April, October and November are the favoured months. Please choose the date that is convenient for you. 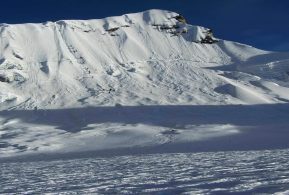 Mera Peak is graded under APline PD+ which suggests it to be a challenging climb. Use of ice axe and crampons is a must to climb these slopes. Since you will be receiving a full day pre-climb training, where you can learn mountaineering skills and know the correct way of using climbing gears, previous experience of climbing is not essential. It would be beneficial to prepare yourself for the climb with some regular training including running, cycling or gym work. Be prepared to walk for 6-7 hrs per day on average. Daily wake up calls will be between 6.00 am to 7.00 am while on trek. You will be served a hot cup of tea/coffee at your tent followed by a small basin of hot water to wash up. Before breakfast you are required to pack your duffel bag as it will be loaded by the porter during breakfast. We will have our lunch break after few hours of trek and ample time to rest and perhaps some reading during that break. Trek after lunch will be generally shorter enabling us to reach camp. Tea and coffee awaits you at the campsite and your tents will be set up before you arrive. Hot water will be given for wash up before dinner is served usually at 6.00 pm. Please bring your flask and/or water bottles for refill of hot water/drinking water for personal use at night. After dinner, the evening is free to play cards and recall the day's adventures, before heading off to bed for a well-earned sleep. We consider hearty and delicious meals as a key component to the overall success of our trip. Our Chef will prepare exceptional meals and ensure its quality preparation during the trekking/climbing period. You can and is encouraged to bring along comfort food which you enjoy eating - chocolates, power bars, dry fruits, candies, other snacks etc. In Kathmandu we stay at Kathmandu Guest House, a well-known hotel where many famous celebrities like Beatles, Ricky Martin, Jeremy Irons and others have stayed. 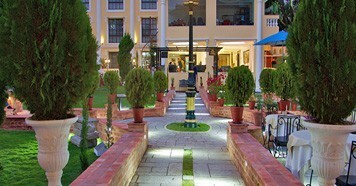 Centrally located in Thamel, the hotel also boasts of a beautiful garden where you can relax and enjoy the greenery. Breakfast will be provided in the hotel and your accommodation will be on twin sharing basis and if you would like to have single room, upon request you are required to pay single supplement price as stated in the trip costing. We provide high quality mountain tents for our camping trips. For every 2 persons, a tent is provided together with a sleeping bag, mattress, pillow and other for comfort. You can consider to bring along an extra mattress or inflatable mat. Our emphasis is always on maintaining the small group so that it will be easy to coordinate and cooperate with each other. Our group size is small and we only take up to 12 pax in one group. If you opt to join our ‘fixed departure trip’, you are likely to be joining people from different countries of any age group except minors. The size of group varies, minimum no of persons required to operate a trip is 1 the maximum is 12 people. Though tipping is not compulsory but gratuity is appreciated. A suggestion of an allocation of USD8.00-10.00 per day per person for climbing trips – this can be handed to the leader/Sirdar at the end of the trek in the presence of the staff for distribution as gratitude. You can also give away your trekking equipment such as boots, jackets, trekking poles, head torches to the crew. Telephone facilities in the Mera region is poor. Connection for cell phones is fair on onpy same places on trek. On peak climbing trips, we always provide satellite phone for emergency purpose. If you need to keep in contact with our family or others, kindly request from us in advance a local sim card. 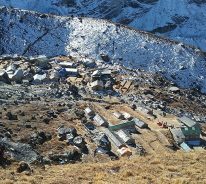 Mera region is also expensive than the other regions in Nepal, as most of the goods has to be air-flown and then laboriously carried to their final destination by porters. You need cash for table drinks (alcoholic/non-alcoholic beverages), snacks while walking (a few smaller shops are available along the trail in some areas) tips, souvenirs, hot shower (only available in some places). 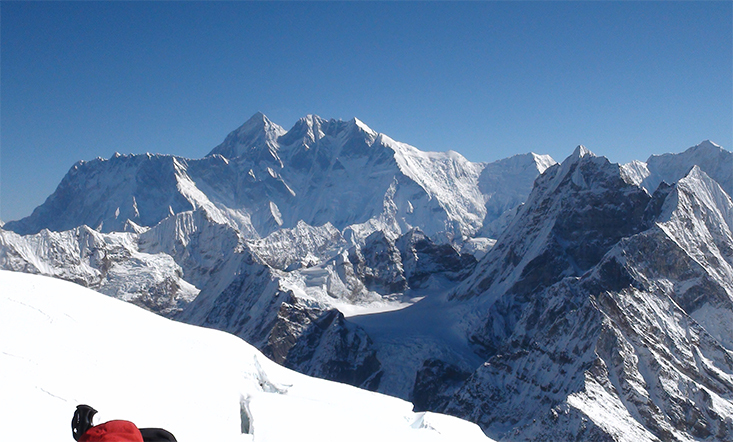 I highly recommend Highland Expeditions to anyone looking for trekking and climbing in Nepal. I climbed Mera Peak together with the team of Highland Expeditions and what an experience it was. The entire trip was well planned and the itinerary was devised nicely with slow ascent and more acclimatization, the entire staff was amazing, especially our guide Pemba, who was incredibly friendly and expert in his work. In general Highland Expeditions delivered a great service.